The finished piece is about 6.5″ in diameter. I also designed a simpler version with only one row of petals and smaller leaves. I can write up and post the patterns for both, if anyone is interested? I am not sure I have to belong to a group to get the poinsettias patterns but if possible I would like to have them. They look better than the patterns I bought in books and magazines. Oh, that is so pretty! I would love a pattern. It would make a great napkin ring for Christmas. i’d be interested in trying my hand at these for attaching to christmas gift packages – yes, i’d love the pattern! I really admire this poinsettia and would greatly appreciate instructions for it. My family doesn’t do alot of christmas so Ilike to wear a “corsage” each year as my little show of christmas. 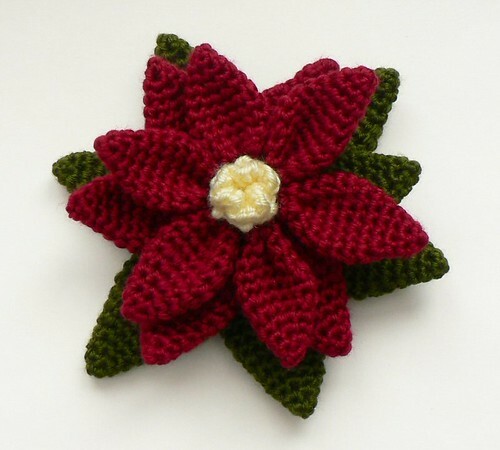 I’d love to make one that matches the shawl I’m crocheting, so I can wear it when it’s christmas. Was going to say “me too” but yay! the pattern is forthcoming. This is great! Again, cute, cute and why not, cute! I would love the pattern. It would look great on this scarf I am making. This is just great. I love this poinsettia and I have never seen anything like this. Please write the pattern. I would love to have the pattern. That is the prettiest one I have ever seen!